Geneva - With over 3,770 estimated deaths, 2015 has been the deadliest year on record for migrants and refugees crossing the Mediterranean, trying to reach Europe. 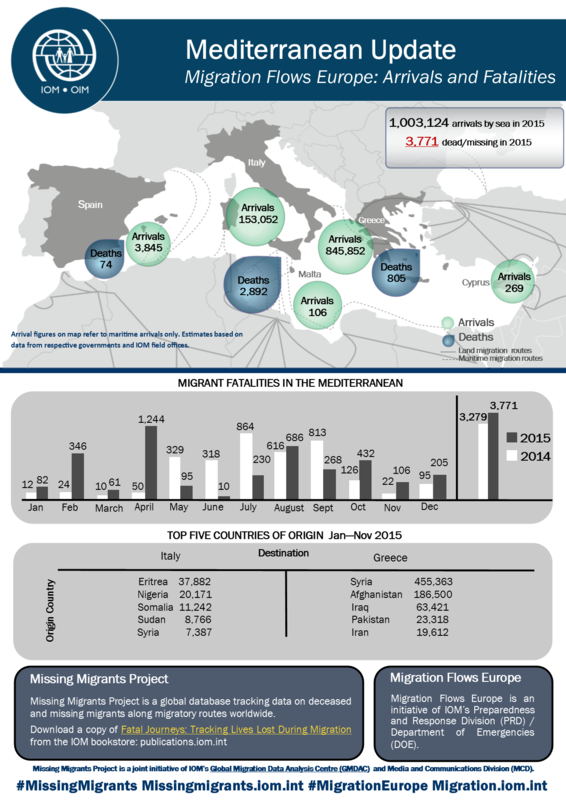 In comparison, approximately 3,270 deaths were recorded in the Mediterranean in 2014. Globally, IOM estimates that over 5,350 migrants died in 2015. The deadliest month in 2015 was April when nearly 1,250 migrants died, mainly due to the worst tragedy on record involving migrants crossing the Mediterranean from North Africa, in which an estimated 800 migrants died when their overcrowded vessel capsized off the coast of Libya. Only 28 survivors were rescued and brought to Italy. Seventy-seven percent (77%) of the deaths occurred in the Central Mediterranean route mostly used by smugglers operating from Libyan shores. This compares to 97% of migrant deaths recorded along this route in 2014. In 2015, 21% of deaths occurred in the Eastern Mediterranean compared to only 1% in 2014. In the Central Mediterranean, deaths recorded were down by 9% from last year with the rate of death at 18.5 deaths per every 1,000 travellers. Globally, the majority of the estimated 5,350 deaths were recorded with the Mediterranean, the most deadly region, followed by Southeast Asia (mostly in the Bay of Bengal, Andaman Sea, Malaysia and Thailand) which saw at least 800 deaths this year. Within Mexico and along the US-Mexico border there have been at least 330 deaths recorded this year. “Migration has been the major theme of 2015, with record numbers of refugees and migrants arriving in Europe, fleeing from conflict and acute poverty. Throughout the year, we have been reminded that much of human mobility is not voluntary and tragically we have seen so many who felt they had no option but to leave their beloved homelands and were lost at sea, in the deserts or trapped in the back of lorries they had hoped would carry them to a safer and better life,” said Ambassador Swing. "One of the major challenges for the coming years would be for the international community to work diligently towards changing from the current toxic migration narrative to one that is more historically accurate, namely, that migration has been overwhelmingly positive. We can do this through measures that will help governments and societies to manage diversity. This will require addressing several paradoxes of (a) national sovereignty of states and individual aspiration of migrants; and, (b) protecting national security on the one hand and human security on the other," Ambassador Swing said. IOM’s Missing Migrants Project which draws on a range of sources to track deaths of migrants along migratory routes across the globe is managed by IOM's Global Migration Data Analysis Centre (GMDAC) in Berlin, Germany. Data from this project was initially published in the report Fatal Journeys: Tracking Lives Lost during Migration, which provided the most comprehensive global tally of migrant fatalities for 2014, and estimates deaths over the past 15 years. Since the publication of Fatal Journeys, IOM has regularly updated the global estimated figures of migrants who have gone missing or have died during the migration process.